Whole grain oats: A great source of soluble fiber, whole grain oats can lower cholesterol levels, reduce risk of heart disease, and may prevent certain types of breast & colon cancer. A serving of whole grain oats in the morning is a great way to start the day. Apples: A good source of vitamin C and soluble fiber, apples can help control blood glucose and cholesterol levels. They also help in the formation of collagen which keeps your skin looking youthful as well as strengthens your veins and capillaries. Blueberries: They are a good source of antioxidants, vitamin C, and fiber. 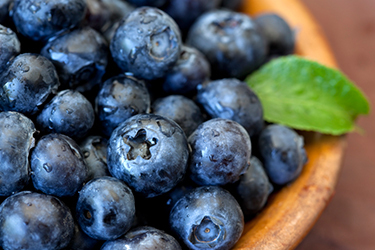 Blueberries may help improve memory and cognitive disorders related to aging. When compared to other fruits, blueberries have less sugar and can help maintain a healthy glycemic index when eaten regularly. You can reap the benefits of blueberries every day all year round as it maintains nutritional value when frozen. Garlic: Well known for its medicinal properties in the ancient world, you can add garlic to virtually anything you are cooking. It has anti-inflammatory and antibiotic properties, improves metabolic function, and can boost your immunity. Sweet Potato: The sweet potato contains a variety of health benefits. It helps to balance blood glucose levels and raises vitamin A levels which is essential of immunity and eye sight. It is best served boiled or steamed. Broccoli: Being very rich in antioxidants, broccoli is one of the best foods you can eat to improve your health and possibly prevent some types of cancer. It also has anti-inflammatory properties. To maintain its health benefits, it is important to not to overcook broccoli. Almonds: Snacking on a few almonds can satiate food cravings while improving your cardiovascular health. They are rich in good fats, which reduces bad cholesterol levels lowering your risk of heart disease. Almonds are also a great source of vitamin E and may reduce signs of ageing. Adding these superfoods to your daily diet will optimize your body’s metabolic function, reduce your risk of chronic diseases, and ensure you look and feel great throughout the day.